Retail marketers who see the customer path as a linear path are out of touch with their customers. The customer journey contains multiple channels where customers expect retailers to remember their preferences and anticipate their needs. 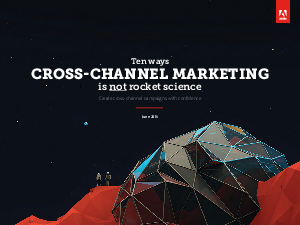 In Ten Ways Cross-Channel Marketing Is Not Rocket Science, you’ll learn how to connect with your customers and reach them in personal and relevant ways — all from reliable data you collect. Identify the data you need to map your customers’ journeys.